If you take the time to look at the numbers that are provided you on ESPN, Yahoo! , or any fantasy sport site you and your league are a part of, you will be amazed at the gems that can be found…Gems that are going virtually unowned. For example, if we were to tell you that the pitcher with a major league leading 15.34 K’s per 9 innings is owned in just 1% of leagues would that be enough of an attention grabber? 1. 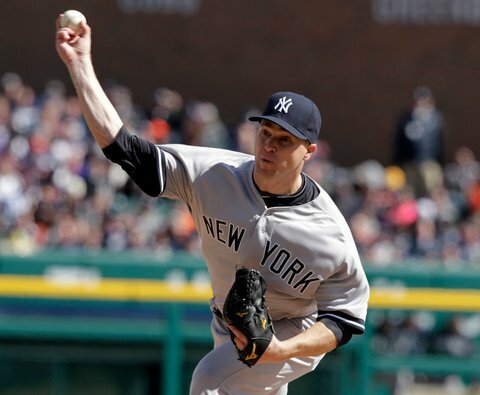 Shawn Kelley-RP-Yankees- Here is our “Special K” of the week! This former Mariner had an awful 2-game stretch in his 3rd and 4th appearance back in the beginning of April, giving up 6 earned runs vs Cleveland and Detroit. By April 8th Kelley’s ERA had ballooned to an unseemly 10.12. It has since dropped almost in half as he has let his K’s do the talking for him. So far this season, Kelley has struck out 38 in just 22 1/3 innings. Kelley has helped keep the Bombers in quite a few games this season. For now, he is someone to consider in deeper leagues and A.L. only leagues. 2. Chris Carter-1B,OF-Astros- Those desperate for a player with some power numbers who is virtually unowned in most leagues, Carter is another who has gone unnoticed. Consider this: Carter has 3 more homers (11) than Albert Pujols, and just one less RBI (31). He’s on pace to hit 30 home runs on the season and yet is owned in just 17% of leagues. His batting average (.223) admittedly is holding him back in many leagues, and yet players like Ike Davis of the Mets who only has 5 homers on the season and is batting an anemic .168 is owned in twice as many leagues. 3. Chad Gaudin-SP,RP-Giants- This well traveled veteran who just might set a record for the amount of times he’s been traded (10) since entering the league in 2003, is someone that we’re touting because he not only won his first game on Sunday vs the Cardinals as a starter since Sept. of 2009 when he was with the Yankees, but his ERA (2.21) and WHIP (1.15) are the lowest of his career. Gaudin is staying on as the Giants’ fifth starter while Ryan Vogelsong continues his DL stint. He’ll face the Diamondbacks this weekend and could be a reliable streamer for some owners. 4. Nate Schierholz-OF-Cubs- This is a serviceable outfielder who, not known for his power, has hit more home runs after 150 at bats so far this season (7) than he has in any other other season after 150 ABs. Schierholz with 4 stolen bases out of 6 attempts also has a very respectable .287 batting average. The former 2nd round pick of the S.F. Giants is another little owneed (10%) that is taylor made for those in A.L. only leagues. 5. 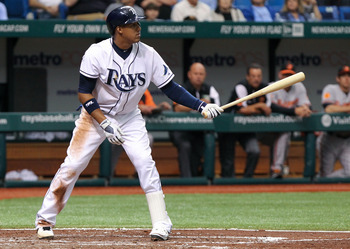 Yunel Escobar-SS-Rays- A career .280 batter, Escobar has just begun to heat things up with his bat over the past couple of weeks. He had been in a slump and as someone who seems to turn it on late, you can catch this little owned MI (10%) who has scored 10, hit 2 homers and driven in 11 since May 20th. Escobar has also raised his batting average over 30 points over that stretch and has 4 multiple hit games in his last eight. This is the time to grab the former 2nd rounder of the Braves. The 30 year old is just 2 seasons removed from scoring 77 runs, hitting 11 homers and batting .290. You could do worse at this lean position.